The Braves welcomed the Dodgers to Atlanta for Game 3 of the NLDS, and the Boys In Blue were looking for a sweep and a ticket into the NLCS. Early on it looked like the Braves would cruise to the win after they got to Walker Buehler early, but the Dodgers fought back to tie the game. A closely contested affair to the end, a Freddie Freeman homer was the difference, and there will be a Game 4 as the Dodgers fell 6-5. Buehler got the start, and there was no reason to not feel completely confident in him, as in the four biggest outings of his career he gave up just two earned runs in 26.2 innings over four starts to close the 2018 season. Things certainly looked promising early, as he got a five-pitch 1-2-3 frame in the 1st that included a strikeout. Unfortunately, the 2nd inning was a complete mess. A lead-off walk is never good, but the threat was muted a bit by back-to-back strikeouts. However, a single to center followed and Cody Bellinger bobbled the ball then unsuccessfully tried to get the runner at third, which resulted in the trailing runner being able to take second. Dave Roberts then elected to issue an intentional walk to load the bases with the pitcher next, and that seemed to be a logical decision at the time. Unfortunately, Buehler immediately lost the zone and walked the opposing pitcher on four straight balls to force a run in. Things got worse from there, as he went 3-0 to Ronald Acuna and then seemed to walk in another run with a pitch up and out of the zone. Hilariously, it was given as a strike, which turned out to be a bad break for the Dodgers as on the next pitch Acuna deposited a 3-1 fastball over the fence in left-center field for a grand slam to make it 5-0. 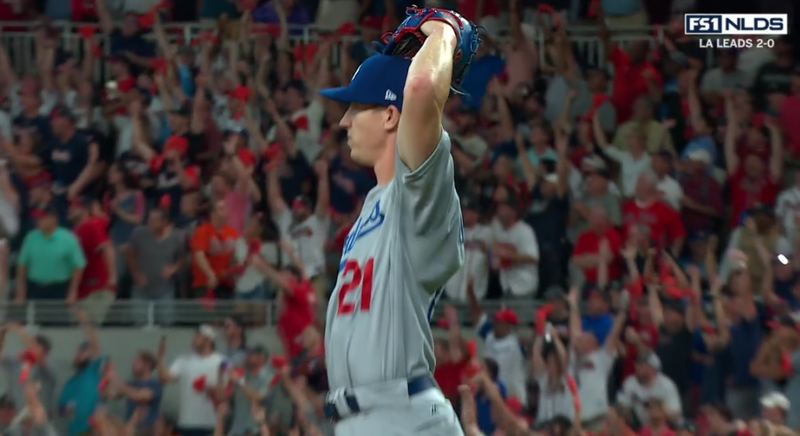 To his credit, Buehler seemed to settle after that mess, getting 10 consecutive outs and getting through five innings on just 77 pitches while striking out seven. He actually only gave up two hits and three walks on the evening, they just all happened to come in one inning. So that left the bats with quite a whole to climb out of, but they were up to the task. Sean Newcomb was a bit of a surprise starter for the Braves, and he figured to to be more of an opener than a conventional starter. 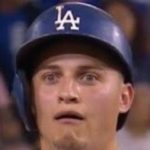 In the first two frames, a single by Justin Turner in the 1st and a walk by Manny Machado in the 2nd were erased on double plays and Newcomb faced the minimum. The Dodgers got their first scoring chance in the 3rd after Enrique Hernandez and Chris Taylor drew walks in the inning, which knocked Newcomb out of the game. With two outs Turner came through with a clean single to left against new pitcher Kevin Gausman, and that ended up scoring two runs after Acuna whiffed on fielding it and JT advanced to second. Max Muncy then drew a walk to put two on with two outs, but Manny couldn’t come through, as he struck out to end the threat. After a 1-2-3 inning in the 4th, the Dodgers came up with a crooked number in the 5th. Yasmani Grandal started it with a walk, and with one down Taylor yanked a two-run homer to left to cut the lead to one at 5-4. With two down, the Braves went to Max Fried, and that backfired immediately as Muncy unloaded on a ball and launched a game-tying homer to right-center. Did he know it? Maybe. The Dodgers seemed poised to take the lead in the 6th, as Matt Kemp led things off against Touki Toussaint with a double and advanced to third on a ground out. However, Enrique grounded to short with the infield in and Kemp was thrown out at home on a close play. Still, following back-to-back walks from Grandal and Yasiel Puig, the bases were loaded and they had another chance, but CT3 grounded out meekly to end the threat. 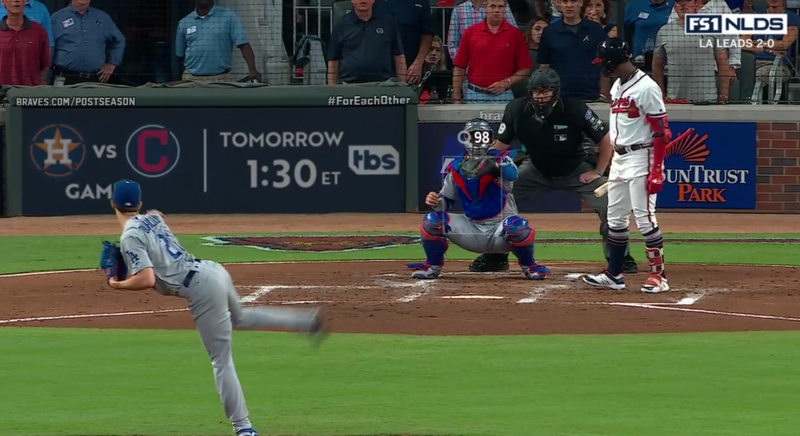 That proved costly almost instantly, as Alex Wood entered in the 6th in relief and saw his first pitch get bombed to right by Freeman to give the Braves a 6-5 lead. After getting a ground out, he was removed, and it’s fair to question Roberts going to Wood there for two lefties instead of the guy groomed as a LOOGY towards the end of the season in Scott Alexander. Anyway, Ryan Madson was next, and while he allowed a single in his time, he got out of the 6th with a strikeout and fly out. The offense went quietly in the 7th against Chad Sobotka, reducing the amount of outs they had left to six. Pedro Baez then entered in relief, and while he allowed a walk, he also struck out the side. Brian Dozier started the 8th with a single off A.J. Minter, but he got the next two batters before walking Grandal. That brought up Puig, who grounded out to short to end the threat. Alexander ended up starting the 8th, and kept things at one run, getting a 1-2-3 frame that didn’t exactly inspire confidence but was clean nonetheless. That brought in Arodys Vizcaino to close things out for the Braves in the 9th. Joc Pederson started the inning with a 10-pitch at-bat in which he roped a ball so hard off the wall in right that it was just a single and Turner then followed by working a 7-pitch walk. Muncy then worked a 3-0 count, but Vizcaino battled back and eventually struck him out and he then got Machado as well. That left things up to Dozier, the last hope, who also struck out to end it. The Dodgers losing obviously forces a Game 4 in the NLDS against the Braves, which will take place tomorrow at 10:30 AM HST/1:30 PM PST/4:30 PM EST. One assumes that the Dodgers will go with Rich Hill and the Braves will go with Mike Foltynewicz on short rest, though they could opt to go with Julio Teheran as well. Series definitely got interesting all of a sudden.